I’ve never been much of a joiner. I was an accredited member of the RFU referees for U11s but apart from that I steer clear from joining things. Apart from the Mothers’ Union. I know, I know, it sounds bonkers that a bloke should be in the MU, but I belong so that I can promote the fantastic things they do. Today we remember Mary Sumner, born near Salford, founder member of the Mothers’ Union. Educated at home, Mary learned to speak three foreign languages and sing. 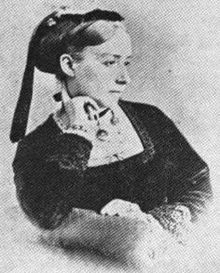 She travelled to Rome to further her musical studies, met her future husband, George Sumner, son of Charles Sumner, Bishop of Winchester and a relative of William Wilberforce. Sumner publicized a meeting of mothers in her parish to offer mutual support. Her plan was quite radical in its day as it involved calling women of all social classes to support one another. In 1885, she was invited by the Bishop of Newcastle to address the women churchgoers. He felt that he had very little to say to women. Some of the women present went back to their parishes to found mothers' meetings on Sumner's pattern. And so the Mothers’ Union was born. God’s love is shown through loving, respectful and flourishing relationships. This is not a vague hope, but a goal we actively pursue by praying, campaigning and enabling. Find out more about the Mothers’ Union here.